Paula Bartley’s Queen Victoria examines Victorian Britain from the perspective of the Queen. Victoria’s personal and political actions are discussed in relation to contemporary shifts in Britain’s society, politics and culture, examining to what extent they did – or did not – influence events throughout her reign. 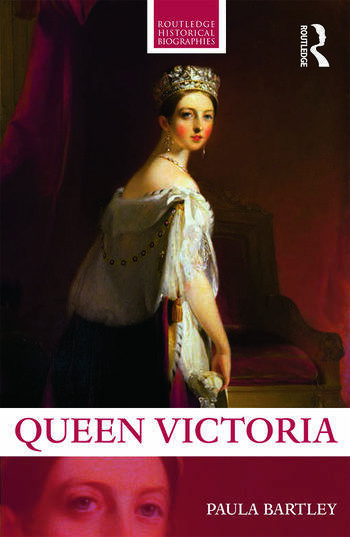 Drawing from contemporary sources, including Queen Victoria’s own diaries, as well as the most recent scholarship, the book contextualises Victoria historically by placing her in the centre of an unparalleled period of innovation and reform, in which the social and political landscape of Britain, and its growing empire, was transformed. Balancing Victoria’s private and public roles, it will examine the cultural paradox of the Queen’s rule in relation to the changing role of women: she was a devoted wife, prolific mother and obsessive widow, who was also Queen of a large Empire and Empress of India. Marrying cultural history, gender history and other histories ‘from below’ with high politics, war and diplomacy, this is a concise and accessible introduction to Queen Victoria’s life for students of Victorian Britain and the British Empire. Paula Bartley has published extensively on women’s history. Her previous publications include Emmeline Pankhurst (Routledge Historical Biographies, 2002), Votes for Women (2007), and Ellen Wilkinson: from Red Suffragist to Government Minister (2014). "This brief and engaging study skillfully situates Victoria's life within the context of the rapidly changing political, social and international condition of Britain. Bartley is particularly strong on Victoria's interventions in complex political and foreign policy questions, allowing the biography to serve as an introduction to these questions as well as to Victoria's life." "Bartley's book is far from being a hagiography. It provides a frank and refreshing view of Victoria. By allowing her to speak for herself through her letters and journals she confirms many of the criticisms expressed by Dilke and later by Charles Trevelyan. But it is hard not to be charmed by her vulnerability and impressed by the way she applied herself to her role as monarch for 60 years, steering Britain through a century in which it could easily have fallen apart."